Fridays & Saturdays - 7:00 PM - ? Or, skip the line and get a FAST PASS for an extra $5.00! October 28th is Kids Day from 2:00-5:00 P.M. Kids Day Price is $10.00 per person for those times only. 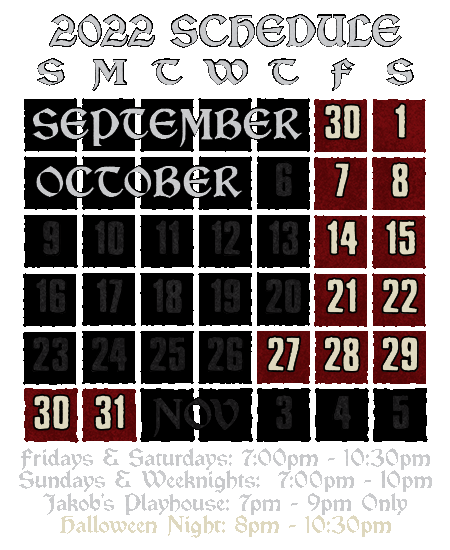 Regular Haunt show is from 7:00-10:00 P.M.
November 3rd is Blackout day with No Lights On! October 15th will be Cedar Bend Humane Society nite. $1.00 of every admission sold will benefit the Humane Society. Copyright © 2004 - Horrid Hollow Productions, LLC. All Rights Reserved.